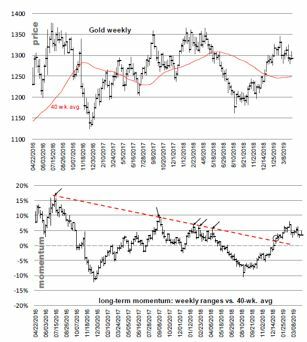 “In our April 2nd report (front month gold was then at $1289, where it is now), we suggested that if one were long and nervous, hedging a long position at that point (gold or miners) would not be costly. Meaning, even if the downside does not occur or is short-lived and shallow, there’s a number not far overhead that would argue going back to a full long position. That number adjusts lower each week and is defined by the downtrend plotted through weekly closes. This week we needed to see a weekly close at $1306 or higher. April Gold traded above there, but we want a weekly close at or above $1306. Next week that upturn number on this shorter -term momentum chart will adjust down quite a bit (current estimate is $1298, applicable for next week, but we’ll update with a specific number in the Weekend Report). “What has occurred since April 2nd has been more downside, enough to take out the early March price low of $1280.80 with a trade last week down to $1279.50. Weekly momentum, however, did not confirm that weak price action, as the oscillator turned up from a higher low than early March. Rally followed. Now another redundant selloff. “We suspect that if there’s more downside, it will not be what so many think it will be—namely, a drop to the low $1200s. We still think what’s been happening for three and a half months now is continual effort by bears to get downside underway. Three and now maybe four distinct selloffs in gold, but only creating mostly sideways action on either side of $1300.